1. There is no evidence to support Donald Trump’s false tweets via right-wing radio host Mark Levin, Breitbart News and Brent Baier of FOX News that President Obama “wire tapped” Trump Tower. Period. Full stop. 2. There is no evidence to support White House pres secretary “Baghdad Sean” Spicer’s and Trump’s false claim via 9/11 Truther Andrew Napolitano of FOX News that British intelligence GCHQ “wire tapped” Trump and his campaign. Period. Full stop. Shepherd Smith of FOX News already distanced FOX News from Napolitano’s “utterly ridiculous” claim. Shep Smith: “Fox News Cannot Confirm Judge Napolitano’s Commentary”. 3. The FBI and intelligence agencies are conducting an investigation into Russian interference in the U.S. election. well, duh! 4. The FBI is conducting an investigation into possible “coordination” between Russia and individuals associated with the Trump campaign. Until today, the FBI had refused to privately acknowledge the existence of an investigation, let alone what it is looking into. This is the “big news” of the day from the hearing. The House Intelligence Committee shed some official light on a topic that has been the subject of a great deal of media reporting — and gave members of both parties a chance to score political points. Here are the highlights. James B. Comey, the F.B.I. director, confirmed early in Monday’s hearing that the bureau is indeed, as has been widely reported, investigating the interference by Russian intelligence in the 2016 American presidential election — including any possible collusion by aides and associates of President Trump. Mr. Comey noted that usual F.B.I. practice is “not to confirm the existence of ongoing investigations,” and that the Justice Department had approved his departure from that practice. He did not address what everyone in the room was thinking: that Mr. Comey last year famously broke that rule repeatedly to discuss the F.B.I. investigation of Hillary Clinton’s use of a private email server as secretary of state, producing negative publicity that some believe cost her the presidency. In strong statements, both Mr. Comey and Adm. Michael S. Rogers, director of the National Security Agency, definitively dismissed Mr. Trump’s March 4 Twitter posts claiming that he and his campaign had been the target of eavesdropping ordered by former President Barack Obama. While the two officials hedged their answers on some questions and declined to answer others, they were unequivocal in rebutting Mr. Trump’s claims. Admiral Rogers was asked about another theory, first floated on Fox News and repeated by Sean Spicer, the White House press secretary: that Mr. Obama had asked the British spy agency, known as G.C.H.Q., to intercept Mr. Trump’s communications. “Would you agree?” Mr. Schiff asked. “Yes, sir,” said Admiral Rogers. Mr. Schiff, who worked as a federal prosecutor in Los Angeles early in his career, used his opening statement (video) at the hearing — unusually long at 15 minutes — to weave a circumstantial case of striking and mysterious connections between Mr. Trump’s associates and Russia. “The Russians successfully meddled in our democracy and our intelligence agencies have concluded they will do so again,” Mr. Schiff said. Mr. Schiff’s statement is also the conclusion of the C.I.A., the F.B.I. and the N.S.A., accepted even by most Republicans. But then he went on to enumerate the many Trump aides believed to have some kind of contact or communication with Russians: Carter Page, a foreign policy adviser; Paul Manafort, Mr. Trump’s second campaign manager; Roger J. Stone Jr., a political adviser; Michael T. Flynn, who was forced out as Mr. Trump’s first national security adviser; and others. Mr. Schiff relied in part on a so-called dossier on Trump-Russia contacts put together by a former British intelligence officer, Christopher Steele, who was paid by Mr. Trump’s Republican rivals and later by Clinton supporters. Mr. Steele is “highly regarded” by intelligence colleagues, Mr. Schiff noted accurately. But he did not say that the dossier is made up of unproven hearsay from Mr. Steele’s sources, much of which journalists have been unable to confirm. Note: Schiff relied on the parts of the dossier that have been confirmed by the intelligence agencies. Just because some reporter hasn’t been able to confirm the most salacious parts of the dossier doesn’t mean that other parts of the dossier are not solid intelligence that has been confirmed. Schiff made a case from what the House Intelligence Committee does know, as any good prosecutor would. 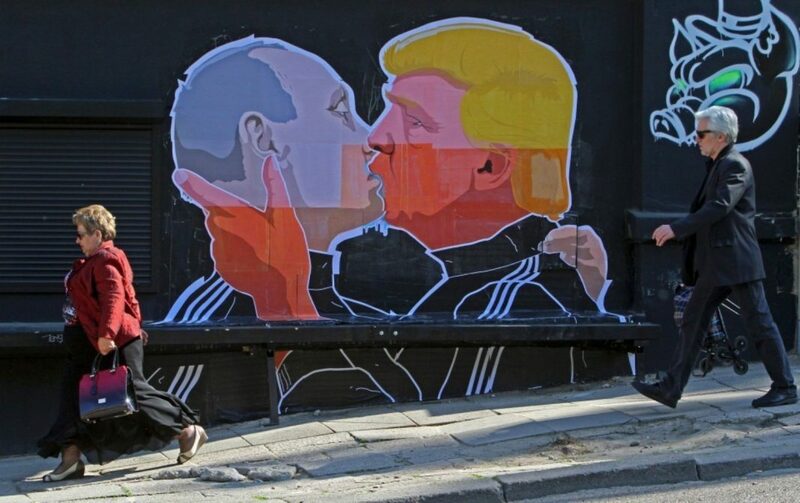 One of Trump’s national security advisers during the campaign, Carter Page, has ties to Russia and has praised its president, Vladimir Putin. Former Trump adviser Roger Stone boasted in a speech that he knew of impending WikiLeaks documents related to Hillary Clinton’s campaign before they were published. And Flynn and Sessions would go on to avoid disclosing their conversations with the Russian ambassador during or shortly after the campaign. Comey and Rogers would not comment. Representative Trey Gowdy, Republican of South Carolina — another former federal prosecutor — pursued a parallel strategy, but with a different target altogether: The unnamed officials and former officials who have leaked to the media about Trump-Russia issues. What was disturbing, Mr. Gowdy suggested, was not the evidence of Russian connections, but the fact that they were disclosed to the public. Mr. Comey appeared more uncomfortable when Mr. Gowdy asked him about a list of senior Obama administration officials whom the Republican Congressman clearly hinted might be the source of leaks. Mr. Gowdy questioned the F.B.I. director about which officials were empowered to learn the names of Americans picked up in intelligence intercepts, even when the names were redacted from intelligence reports for privacy reasons. “Would former Attorney General Loretta Lynch have access to an unmasked U.S. citizen’s name?” Mr. Gowdy asked. “In general, yes, as would any attorney general,” Mr. Comey replied. Note: There are dozens of people in the federal government who have access to “unmasking” U.S. citizens’ names from “incidental collection” of surveillance. This is the Tea-Publican manufactured scandal du jour: it was Obama officials who leaked information to the media to “unmask” U.S. citizen Michael Flynn from “incidental collection” of FISA surveillance of the Russians. Just like Trump, an allegation made without proof. Rep. Joaquín Castro (D-TX) retorted that it is just as possible the leaks came from someone in the White House who wants to save the president from those around him. Some Tea-Publicans on the panel even suggested that the media were dupes and their sources could have been Russian operatives. This was the “have I got a conspiracy theory for you!” portion of the hearing. This is why there is an investigation, Congress doesn’t know. Tea-Publicans like Trey Gowdy who imply that reporters should be prosecuted for reporting classified information should consult the First Amendment and a long series of court cases that reject his position. Does Hurting One Candidate Mean Helping Her Opponent? Under questioning from Representative K. Michael Conaway, Republican of Texas, Mr. Comey confirmed the intelligence agencies’ findings that the goal of Russian interference in the election was to hurt Mrs. Clinton, a particular target of the ire of Russian President Vladimir V. Putin. “To be clear, Mr. Conaway, we all agreed with that judgment,” Mr. Comey said, and Admiral Rogers added his assent. But Mr. Conaway repeatedly probed the agencies’ additional conclusion: that Russia, and Mr. Putin, also wanted to help Mr. Trump. Mr. Conaway attempted a sports analogy — “my wife’s Red Raiders are playing the Texas Longhorns” — and Mr. Comey gamely followed his lead. “Whoever the Red Raiders are playing, you want the Red Raiders to win, by definition, you want their opponent to lose,” the F.B.I. director said. But their exchange went on for several minutes, exploring a sort of Zen riddle of whether trying to defeat Mrs. Clinton meant trying to elect Mr. Trump. This later was reprised by Comey giving an example of how much he hates the New England Patriots and wants them to lose and the team they are playing to win, because he is a New York Giants fan. That was despite assurances from both Mr Comey and the National Security Agency director, Mike Rogers, that no such surveillance had taken place. Trump’s unproven allegations against his predecessor have left him increasingly isolated, with fellow Republican as well as Democratic lawmakers saying they’ve seen nothing from intelligence agencies to support his claim. But the White House, keen to deflect attention away from the alleged links between Russia and the Trump team, insisted it remained concerned about the activities of the intelligence agencies in monitoring Mr Trump. 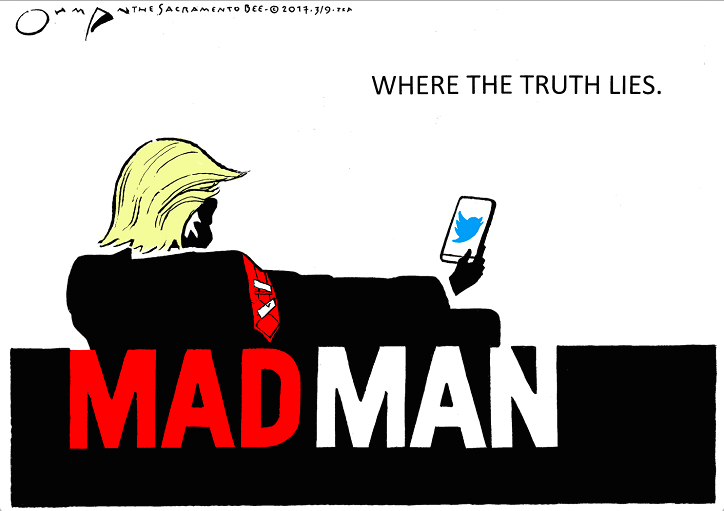 The President took to Twitter before the hearing began to accuse Democrats of making up allegations about his campaign associates’ contact with Russia during the election. He said Congress and the FBI should be going after media leaks and maybe even Hillary Clinton instead. “The real story that Congress, the FBI and others should be looking into is the leaking of Classified information. Must find leaker now!” Mr Trump tweeted. A short time later, ranking Democrat Rep. Adam Schiff read the tweet to FBI Director James Comey who was testifying, along with Adm. Mike Rogers, the director of the National Security Agency. “Is that accurate?” Schiff asked Comey. The president also noted an exchange between Republican Rep. Trey Gowdy and Comey about former National Security Adviser Michael Flynn. “Did you brief President Obama on any calls involving Michael Flynn?” Gowdy asked. “I’m not gonna get into either that particular case, that matter, or any conversations I had with the president. So I can’t answer that,” Comey responded. This is because Comey cannot confirm or deny anything that is part of an ongoing investigation in a public hearing — despite his unprecedented departure from this FBI protocol with the Hillary Clinton private server investigation last year. At the White House, Press Secretary Sean Spicer tried to downplay the role of Flynn and Paul Manafort, the second of three Trump campaign managers, both of whom were removed from positions for their connections to Russia. “Gen. Flynn was a volunteer of the campaign, and then obviously there’s been this discussion of Paul Manafort who played a very limited role for a very limited amount of time,” Spicer said. “Limited role“? Gen. Flynn was named National Security Advisor without proper vetting of his financial ties to Turkey and Russia. Manafort was Trump’s campaign manager for chrissake! (Recommended by longtime GOP ratfucker Roger Stone, who had “back channel” contacts with Russian hacker(s) Gucifer 2.0 and Wikileaks). Spicer asserted that no evidence has been presented to suggest cooperation between Trump associates and Russian operatives. “When the people who have been briefed by the FBI about collusion between individuals, the answer is — continues to be ‘no,’ and at some point, take no for an answer,” he said. If this is his answer to Trump’s provably false tweets, it is also the answer to the FBI’s ongoing investigation into “cooperation” between Russia and persons associated with the Trump campaign. And by the way, “Baghdad Sean” cannot disclose what was revealed in classified briefings to members of Congress or to the president, or he also is subject to prosecution for disseminate classified information, as Rep. Trey Gowdy emphasized. The fact that there even is an FBI investigation, since last July, is indicative that the FBI believed there was sufficient evidence to warrant an FBI investigation. This does not mean that a crime has been committed, or that anyone will eventually be charged with a crime, but we sure as hell need to find out what was going on with the Russians. Paul Manafort, Former Trump Campaign Chief, Faces New Allegations in Ukraine: On Monday, a member of Parliament in Ukraine released documents that he said showed that Mr. Manafort took steps to hide the payments from a pro-Russian party in Ukraine, which were tied to Mr. Manafort’s work for former President Viktor F. Yanukovych. The documents included an invoice that appeared to show $750,000 funneled through an offshore account and disguised as payment for computers. A Ukrainian lawmaker on Tuesday released new financial documents allegedly showing that a former campaign chairman to President Trump laundered payments from the party of a disgraced ex-leader of Ukraine using offshore accounts in Belize and Kyrgyzstan. New documents show Trump aide hid payments from Ukraine party with Moscow ties, lawmaker alleges. American and Ukrainian officials are pushing to question President Donald Trump’s former campaign chairman Paul Manafort in separate investigations related to his work for a pro-Russian political party in Ukraine once headed by that country’s disgraced former president Viktor Yanukovych. Manafort sought for questioning – in D.C. and Kiev. Rep. Jim Himes (D-Conn.) told POLITICO that Manafort “would certainly be at the top of my list to testify” before the House Intelligence Committee’s ongoing investigation of Russian meddling in the 2016 presidential election. Roger J. Stone Jr., the onetime political consultant and full-time provocateur, a Trump loyalist and self-proclaimed “dirty trickster” who nurtured the dream of a presidential run by the developer-turned-television-star for 30 years is under FBI investigation. Roger Stone, the ‘Trickster’ on Trump’s Side, Is Under F.B.I. Scrutiny: Mr. Stone, known for his pinstripe suits, the Nixon tattoo spanning his shoulder blades, and decades of outlandish statements, is under investigation for what would be his dirtiest trick — colluding with the Russians to defeat Hillary Clinton and put his friend in the White House. Andrew Napolitano, the senior legal analyst for Fox News, has been “temporarily sidelined” following his unproved assertion last week that former President Barack Obama had asked for British assistance in spying on Donald J. Trump, a person briefed on the decision said on Monday. Oh, he’ll be back with his wild conspiracy theories. Fox News Sidelines Andrew Napolitano After Wiretap Allegation. Say what? Part of Putin’s plan to undermine NATO. Rex Tillerson will go to Russia but skip NATO meeting next month. comey says fbi is investigating wither trump colludes with russia to commit crimes toillegaly alter 2016 election results since june of 2016 and then says no surveillance of trump or server. interesting investigation. So the Birther King makes up stuff? Shocking! Let’s take a drive down memory lane, to mid-2016, a simpler time, when the Trump campaign leaned on the GOP to remove a plank from their party platform, the one about sending weapons to Ukraine. Those weapons that Putin didn’t want Ukraine to have? The same Putin that didn’t want Clinton (I can relate) to win? I wonder if that’s related to anything happening now? Disgraced former General Michael Flynn is lucky the GOP is running everything, because that wing nut should be in prison. 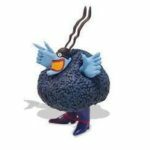 What was disturbing, Blue Meanie suggested, was not the evidence of the Clinton campaign’s racism and bigotry, but the fact that they were disclosed to the public. The stock market being down by 8 points today means nothing, could just be that today’s weather was different than what was expected. But, the stock market being up by 3 trillion since being surprised by President Trump’s election means a lot, it means that Hillary’s $1.1 billion spending to convince voters of a better future under her leadership was most likely a fraud. Obama averaged 218,000 jobs a month and only 190,000 a month in his last year. What arguments are you going to have about the election being stolen with a junior high school computer prank when job creation hits 490,000 a month? There is no evidence that the stock market being up reflects anything but the market expectation that there will be more after-tax profits for corporations, and an increase in the share of national income going to capital instead of labor. You are correct, no proof yet, not yet. As of today, the stock market is no longer up 3 trillion, only 2.5 trillion. The probability of health care passing is fading. The passage of the health care bill would release the caps on small business which are the major job generators in the economy. Also, the probability of a very robust tax rate cut appears to be fading a little too. Small businesses are NOT the major job creators, new businesses create jobs. This myth lingers because people like you repeat it without verifying it. Small businesses tend to stay small, mom and pop stuff, large businesses merge and/or find other ways to shed employees, or offshore them, including US banks. New businesses are the real job creators, and the ACA enabled people to quit their jobs and start new businesses, because they were no longer tied to employer based healthcare. mike rogers did russia interfere with election in wisconsin NO! michigan NO! pennsylvania NO! north carolna NO! any state bueler anyone. NO evidence trump or his campaign colludes with russia to commit crimes to steal the election. even you have to admit you have no evidence of a crime being committed by trump to steal 2016 election. congressman schiff had innuendos and was shucking and jivan. but had to admit no evidence of any election crime committed by trump or even his campaign. SSDD. comey wouldn’t admint what he was investigating. By now, censored, you must realize that when it comes to the Trump Administration, “evidence” is not needed when innuendo and rumor are available. Of course, evidence is demanded from Trump for his accusations, but not so much from his accusers. Think Watergate and the coverup. John Dean’s take on all this would be hard to ignore. Fox should invite him on their show. The stock market was down 8 points today. This definitely proves: A. Obama is taking our guns away by secret chemtrails methods, B. Judge Gorsuch is the greatest Judical mind since John Marshall, C. Senate Judicary committee Republicans have broken all records on hypocrisy, to the point where satire doesn’t anywhere approach reality from these bums. D. Trump and any member of Trump’s campaign never even heard of a country known as Russia. They thought they were talking to Andorra or Tonga. Thank you for posting a synopsis of the hearing. I was busy and couldn’t watch it. Your reasonably balanced presentation presented some interesting points. True. But common sense would say that it is more likely to come from sources opposed to Trump. Sources like the Obama White House. Agreed. It could be an interesting investigation. However, I think I heard Comey say it could go on for months, or even years. Months would be okay, but years?!?!? That would be a drag.